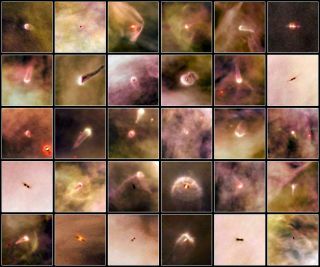 This new atlas features 30 proplyds, or protoplanetary discs, that were recently discovered in the majestic Orion Nebula using the Hubble Space Telescope. An odd array of 30 newly released images from the Hubble Space Telescope reveal planetary systems in the making. The blobs and smudges, as astronomers described them, sit in the widely photographed Orion Nebula. Each object is known as a proplyds, or protoplanetary discs, and could be forming planets as you read this. Among the images is one astronomers called a "space jellyfish." Its odd shape is created by shock waves that form when a wind of particles from a nearby massive star collides with the material of the proplyd. The Orion Nebula is known to be a hotbed of star formation. Our own sun might have developed in a similar dense cloud of gas and dust, before being kicked out to its current lonely existence. In the nebula, newborn stars emerge from the nebula's mixture of gas and dust, and the proplyds form around them. The center of a disc, which is rotating, heats up and becomes a new star, but remnants around the outskirts of the disc attract other bits of dust and clump together, astronomers explained. Each developing planetary system has its own look. Some of the discs appear face-on, and others edge-on. Some have emerging jets of material. Visible to the naked eye under very dark sky conditions, the Orion Nebula has been known since ancient times and was first described in the early 17th century by the French astronomer Nicolas-Claude Fabri de Peiresc. At 1,500 light-years away, it is the closest star-forming region to Earth. The new collection of photographs will help astronomers better understand the planet-formation process, researchers said in a statement today.